Protected against UV degradation, extremely strong, manufactured out of bi-oriented polypropylene to increase its strength so it can support the weight of vegetables and foliage even under strong wind conditions. Increases aeration, and this decreases humidity related diseases and fungi. Facilitates pruning, and harvesting. Increases fruit size and quality as well as the physical appearance. Increases the plantation density, improving the flowering and pollination rate. Decreases pathogen mechanical transmission by workers. Perfect for supporting cucurbitceae like cucumber and even melons, it is used for growing tomatoes, peppers, chayote and squash. It will withstand weight of foliage and fruits plus the wind factor to up to almost 41 pounds per foot. 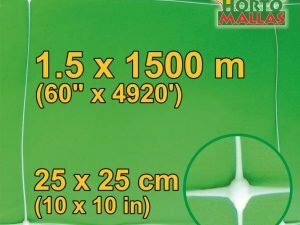 It allows an excellent aeration in between the foliar system, which reduces the need to apply antimicoidals, increasing cultivation density and the revenues for the grower, while at the same time reducing labor and chemical costs. The ample mesh size allows the laborer to work on only one side of the trellis system and by extending the hand on the other side of the furrow and netting without damaging plant or vegetables, contrarily to what happens with smaller mesh sizes. 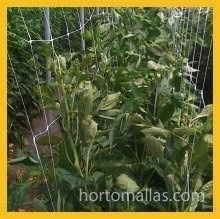 HORTOMALLASTM trellising net can be easily installed 30-50 cm above the soil in the furrow, to take advantage of the plant's capacity (in the case of climbers like cucumbers and beans) to find its way upwards towards the first mesh of the net and not have to spend extra money to cover a larger surface. As one can appreciate from the picture, the plant support netting can stay installed even after the first cultivation cycle, alternating crops, whether they need or not a tutoring system. 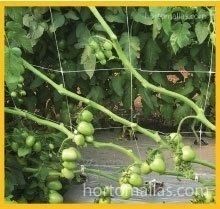 In the case of peppers, eggplants or tomatoes, we recommend using a double wall system, installed lower, as to allow the first line of mesh near the ground on each side of the plant to be tied in order to hold the plant upright as in the picture. Why Vegetable Support and Trellis Netting has become the Standard in Horticulture. 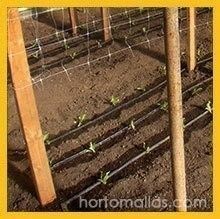 By using vegetable support and trellis netting, the horticulturalist will maintain in balance his need to increase plantation density and to protect his crops from the attacks of external pathogens due to the plant being stressed as it competes for vital growth elements as nutrients and solar exposure. 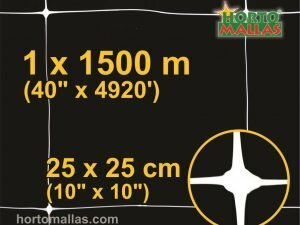 HORTOMALLAS trellis netting is a system that allows the perfect support to the tutored vegetable, allowing the plant to grow vertically and facilitating its expansion across the crop netting surface in such a way that the foliage may express itself fully as far as the photosynthetic capacity and send to the fruits the nutrients it needs and necessary for the success of the farmer! 1) Each time a plant is handled it increases the probability of a mechanical contagion through the hands of the worker, whom could be the vector for a virus or other pathogen being transmitted from another plant in the field, from the outside… or simply from smoking a cigarette on a break! This is the reason, the least a plant is touched the healthier it will be and the least will be spent on agrochemicals, and a lot of these results will be achieved in the type of plant training. Vegetable support and trellis netting helps us reduce hand to plant contact at the initial stages of growth, exactly when the young plant is more vulnerable to pathogens. 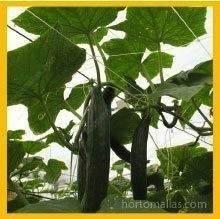 2) The other reason to use vegetable support and trellis netting is that the nature of the plant in its initial development stage is to use energy mainly for its foliage in such a way that it will maximize the solar exposure and ability to photosynthesize; once this natural arrangement is completed the plant will start sending nutrients to the fruits, and this is the phase where the grower starts materializing his/her gains. Due to the need to tutor and guide plants upwards and to the need to support their branches on a traditional trellising system made out raffia weaved among the support posts, the grower will clutter and de-arrange the natural leaves´growing order in order to fasten or tie the plant to the upright tutors. For this reason, the following 3-5 days after the raffia tie-up and excessive handling, will see the plants with the leaves tilted and twisted upside down and generally stressed out. By all means the plant at this stage is trying to concentrate its energy and strength to recoup from the trauma (in some extreme cases the plant can even reach into its fruits to extract nutrients needed to survive)… has anybody ever calculated how many tons of fruits are lost due to the handling the plants manually with raffia twine? The great advantage of a training plants with vegetable trellising net, specially when one uses a double walled trellis netting (one along each side of the furrow, sandwiching the plant in the middle or an installs a V shaped crop tutoring net) is that by leaving the plant “alone” one allows it to grow vigorously and naturally, while its branches will start leaning gently on the tutoring mesh without mechanical stress. The fruits are supported by the peduncle will also reach a comfortable and proper position against the trellis net and the weight of the fruit will not choke its maximum development. From any side you choose to look at it, handling your horticulture crops using tutoring net is a much better technique, before even considering that the trellis net lasts much more than raffia twine. 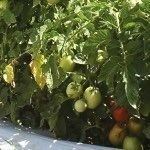 One reaches the conclusion that using tomato or cucumber netting definitely offers technical and competitive advantages in the cultivar on espalier, these advantages are not only expresses in savings of the cost of labor, but also and specially as a great crop yield as far a quantities harvested. 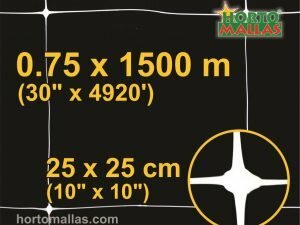 The other aspect to be considered is the quality of the fruits, since net trellised fruits are larger and have a cleaner look as well as a reach color and size uniformity in great percentages, therefore commanding a higher market price for the producer.